Thorbjorn Olesen was unable to capitalise on a brilliant opening nine holes as he ended the second round of the Nordea Masters five shots adrift of leading duo Scott Jamieson and Paul Waring. After birdieing five of his first nine holes, including four in succession from the 15th to the 18th, Olesen posted just one further gain and two bogeys on the way home to sit in a share of seventh on six under for the tournament. The Dane is the highest-ranked player in the field and this competition is a chance to boost his chances of clinching an automatic place on Europe's Ryder Cup team. And he is confident he can be in contention on Sunday. "The first 11 or 12 holes were really tough. The wind was blowing like yesterday afternoon so it was quite tricky but I stroked the ball beautifully," Olesen told the European Tour. "I was swinging the club really nice, middle of the fairways, attacking the pins but I just didn't really get it going. I feel like I could have been really low today. "I would like to keep playing like I did today over the next few days. If I can keep swinging the club the way I did today and keep playing like that, I think I'll have a chance on Sunday." Jamieson finished with a run of three straight birdies to surge to the top of the leaderboard on 11 under, where Waring joined him by signing for an impressive 63. A dropped shot at the ninth – his last – saw Thomas Aiken fall two adrift in third, while overnight leader Clement Sordet bogeyed three holes after his turn to card a two-over 72 and sit level with Olesen, Martin Kaymer and three others. Chris Hanson aced the par-three fifth to assist his rise to tied-13th, level with Sebastien Gros who got a hole in one on six, while Andrew 'Beef' Johnston drew wolf whistles when he changed into waterproof trousers after playing a shot from a boggy area near the 12th green. 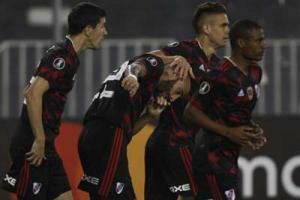 River Plate progressed to the Copa Libertadores knockout stage after a win at Palestino.